The 2018 Bahrain International Air Show (BIAS) will be held at the Sakhir Air Base, Kingdom of Bahrain, November 14 - 16. Held biennially in association with Farnborough International, the event features the latest technology in aerospace as well as exciting aerial demonstrations and exhibits. 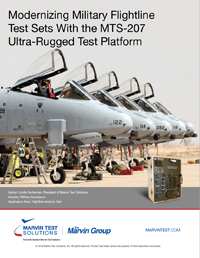 MTS-3060 SmartCan - A universal O-Level armament test set capable of testing both legacy and "smart", MIL-STD-1760-based, weapons systems, the SmartCan supports multiple aircrafts and armament systems in a single hand-held unit, allowing maintainers to benefit from a common test set for multiple systems. MT3045 Advanced Hellfire Missile Simulator - An Advanced Hellfire Missile Simulator (HMS) for the Hellfire Modular Missile System, the MT3045 is capable of simulating Hellfire missiles, tracking critical signals, and displaying status to the operator. For additional information regarding these and other MTS products, please explore our web site or contact us at sales@marvintest.com. If you attend, please visit us in the USA Partnership Pavilion, booth C03. For more information about BIAS or to register, please visit the event website. Marvin Test Solutions’ CEO, Maj Gen Stephen T. Sargeant, USAF (Ret.) and Military Systems Sales Manager, Matthew Koegler will be onsite at BIAS. To arrange a meeting, please contact Jessica at JessicaD@marvintest.com. 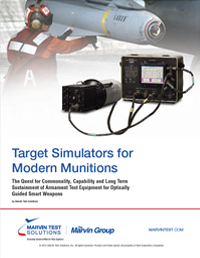 To learn more about how MTS’ comprehensive suite of test solutions supports the warfighter, please register (see right) to download the white papers, “Target Simulators for Modern Munitions” or “Modernizing Military Flightline Test Sets”, or browse our website Knowledgebase for more.